Part of the Honolulu Memorial Park, rising out of the foliage, is the Sanju Pagoda – it’s discernible and it’s deteriorating. With over 20-years of neglect, the neoprene roofing material has sprung leaks, exposing the reinforced concrete rafters to weakening moisture and decay. (Historic Hawaii Foundation) Historic Hawaii Foundation listed it as one of Hawaiʻi’s Most Endangered Historic Sites in 2006. The pagoda is the only concrete pagoda outside of Japan and is built in the authentic fashion of a wood-constructed pagoda. Located in the eastern half of the Honolulu Memorial Park, Kyoto Gardens consists of two large columbarium (a structure of vaults lined with recesses for urns holding a deceased’s cremated remains) structures and a Japanese garden. The Territory of Hawaiʻi established the Honolulu Memorial Park as a community service cemetery in 1958. The Honolulu membership of the Buddhist Federation commended and endorsed the development of the cemetery in 1964, whereupon it was decided that a monument be erected which would honor the followers of the Buddhist faith. Founded by the Richards family, Honolulu Memorial Park includes the Sanju Pagoda along with the Kinkaku-ji memorial, which were completed and opened in July 1966. The name of the Kyoto Gardens was designated in 1966 with the donation of a bronze bell donated by Mayor Takayama of Kyoto, and brought to Honolulu in May of 1966. The inscription on the bell was written in both Japanese and English. In English, it reads: World Peace Forever, and continued with the inscription: Praying for the Everlasting Fellowship of Honolulu and Kyoto, Mayor Yoshizo Takayama, January 1, 1966. With the arrival of the bell, the name of the Nuʻuanu Memorial Gardens Funerary Home was changed to Kyoto Gardens. In 1966, the Senior Minister of the Kinkaku-ji of Kyoto, Japan, Abbot Jikai Murakami, was present for the opening of the Kinkaku-ji memorial and gave his blessing. The three-tiered Pagoda, the Kenkaku-ji Temple and the Mirror Gardens located within the Honolulu Memorial Park are historically important for being the best examples of Japanese traditional-style structures and gardens built outside of Japan. The Pagoda is architecturally significant for three reasons: it was designed with the original proportions of the Nara Pagoda and uses the bracketing construction techniques found in the traditional design; it is the largest pagoda ever built; and it incorporates new construction techniques using concrete and steel. Its height from the foundation to the top of the roof, not including the ku-rin copper spire is 80-feet, the total height, including its spire, is 116-feet. The Kinkaku-ji columbarium models itself after the world-famous Kinkaku-ji located on the grounds of the Roku-on-ji Temple in Kyoto, built in the Muromachi Period (1335-1573) style. The Mirror Lake Garden is also designed in the style of the Muromachi Period (1335-1573.) The design of this garden is based upon the symbols of the Buddha’s world. Originally, carp fish were donated to Mirror Lake – traditionally the significance of the carp fish is a Japanese historical and religious one: carp fish are always found in the ponds of the temples for, through the carp, one’s sins were washed clean. The inspiration and information for this summary is primarily from the National Park Service. While at DLNR, I signed off on the nomination forms to list these improvements on the National Historic Register of Historic Sites; it was listed on February 11, 2004. 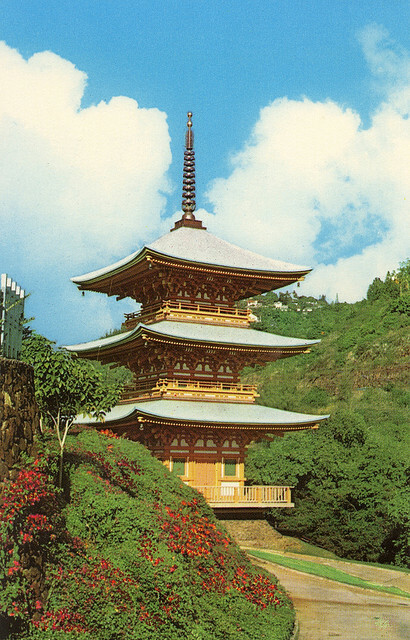 The image shows the Pagoda at Nuʻuanu. In addition, I have included other images in a folder of like name in the Photos section on my Facebook and Google+ pages.